The religion of peace strikes again. If you listen carefully, you can just about hear the agonising screams of someone being burned alive. Good timing, Author, for this resurrection (of the non-miraculous kind). Nice to see Moses back(ing) again. Talking of infrequent visitors, I wonder if Joe (The Hat) Smith has any views on the forthcoming Merkin election? Mo singing R.E.S.P.E.C.T. really needs a youtube video… This could go to number one. Gets my vote for the funniest J&M so far! Oh wow. Oh so perfect. I’ll be singing that all day. Author you are an inspired genius! The last panel is brilliant. Very good, Author! I’ll never hear the song in the same way again! Nah, release it as a single; it’ll make a bomb. Now when I hear that song I won’t think of Aretha Franklin but instead my mental picture will be Mo. One of the all time greats. Ah the glassy eyes of Mo are back. Not to mention roasted ambassador week. Are American ambasador halal? “Brilliant” is indeed the word! Better make sure your government supports US policy or you might be liberated. If you oppose your US approved dictatorship, US bullets and bombs will assure you will be killed as a terrorist. In a comic filled with trenchant comment and side-splitting humor, this stands out as a highlight. Bravo. I know who REALLY deserves respect: AUTHOR! Why have the protesters in Khartoum attacked the German embassy ? Clever and funny. But… only in a cartoon, i.e. nothing clever or funny about an attitude of `you will do as I say or I will kill you’. This is funny in a way, but I don’t like the notion- that too many people believe- that most in Islam are violent. Looks like really just a small faction. Them blaming U.S. is like us blaming all of Islam for 9/11. 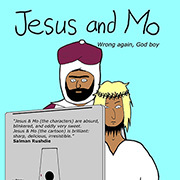 Nothing sums up religious hypocricy over intolerance like http://www.jesusandmo.net/2008/10/21/money/ and http://www.jesusandmo.net/2008/10/24/line/ . But in all seriousness, during one of the last conversations I had with my granddad we were talking about how, even after the industrial-scale slaughter of the two World Wars, humanity in general seemed to have learnt little about settling differences peacefully (he had himself returned home from the Somme with a nasty scar across his abdomen and a healthy contempt for authority; he left behind half of his large intestine and his own belief in God). At the time the Cold War was making people very jittery, and I wondered aloud whether the Americans and Russians really would start throwing nukes around. He said that he didn’t think they’d be quite that stupid and that most of it was just ‘sabre-rattling’, meant to impress the masses rather than to genuinely threaten each other. He then went on to say that, whilst he hoped that none of us would live to see a third World War, if it did happen he was in little doubt that the fuse would be lit in the Middle-East. I had cause to recall that conversation just a few months after Granddad died, when the Palestinian Black September terrorist squad killed eleven Israeli athletes at the Munich Olympics, I’ve often heard his words since and I’m hearing them again now, louder than ever. Like my Granddad before me, I’m hoping that my own grandkids don’t live to see WWIII; sadly, I’m nowhere near as hopeful as he was. On the subject of insulting religion, has anybody else seen the episode of the always excellent Family Guy in which Peter makes a ‘scareJew’ to stop his Jewish neighbour from constantly borrowing from him? At the end of it all you can be sure that ideas that need protecting with threats and violence aren’t very good ideas. Further to what Dan says, it occurred to me that if pictures of the prophet Mo were forbidden for fear of followers worshipping him by mistake … hasn’t it rather backfired? Anyone feel like take offence this morning? All I can say is that your god must be pretty damn weak if he needs you to defend him (with violence) from mockery! WalterWalCarpit, no one murdered, but I for one damn nearly choked on my coffee! Nice one. Islam IS the religion of Peace. You people, steeped in Judeo/Christian beliefs just don’t understand what Peace is. Islamic Peace is accepting Allah as God, that you are nothing more then a servant of Allah. That HIS will controls all. If you get a raise at work? It was Allah’s will, NOT your hard work (or brown nosing). If you come home from work and your wife and children have been raped and murdered? It was Allah’s will. ALL is Allah’s will. Once you accept that, once you realize you have no control, that everything is Allah’s will, you will be at peace. THAT is the Peace they mention. You just coast through life knowing nothing is your fault, nothing is your responsibility. Everything is Allah’s will. You are at peace. Which, of course, is complete and utter rubbish. BUT: You HAVE to understand the enemy to fight him properly. To many people don’t understand Islam; especially the current world Leaders. So we judge savages from the viewpoint of Judeo/Christian values (and yes, we Western atheists have been raised with that viewpoint as well) of ‘turn the other cheek’ and think, “If only we treat them nicely, why, they’ll love us!” never realizing that to THEM those actions show weakness, not strength. To them, it is a clarion call that the time is ripe to ATTACK, and force their will upon us. Wolf, have you seen http://www.jesusandmo.net/2010/03/19/peace/ ? Now that song will be stuck in my head all day . . . thanks a lot Mo . . . Jeesh! Islam demands to be respected? From those it has not already infected? This cult is to be shunned and rejected. @ AoS – thanks for that reminder, it gave me a good laugh before I went to bed last night. One of the advantages of a declining memory in old age is enjoying again a joke long forgotten. @ NBH – I would give nine out of ten for that effort. Tidy up the scansion and you’ll have a ten! Yep Acolyte, I’ve read all of ’em! I just wish I could find that bar they’re always hanging out with. The people causing all the mayhem are obviously loving it. They’d be heartbroken if people actually stopped criticising their beliefs. Jesus and Mo walk into a bar. OUCH! You’d think one of ’em would have seen it. I thought this one was quite topical. @european if the missing one you’re thinking of is the one I’m thinking you’re thinking of I’m thinking you might be missing the point … of the headline. And if we are now all thinking of Mo being the one missing from that paparazzi portrait session, is anyone else missing an animal? WalterWalcarpit and European, it took some time for the meaning of that image to sink in. Yes, there’s somebody missing and that’s the point. All the other religions express their outrage by rolling their eyes and going on their way. There seems to be only one that thinks an insult should be repaid with a murder. I just finished reading “The Caged Virgin” by Ayaan Hirsi Ali, who wrote the script for the film that got Theo Van Gogh murdered. Nothing in what she says or in that script is the least bit unreasonable or provocative to a reasonable thinking person, yet a man died because nutters took offense. Seems to me that pointing a finger at Islam is totally legitimate. Am i missing something? @Walter: Thanks for sharing this link! But Mo is in the ‘nobody got murdered’ picture. Who do you think is playing the part of Ganesha’s arse? No, DH, you are right on the point. And I’m thinking that the missing prophet (PBUH) probably wouldn’t be playing with the others anyway – nor with an animal for that matter – but with a nine year old girl. Nutters is generous. Unenlightened proto adolescents after any excuse for a riot. Used to happen a lot in Northern Ireland. Still does. But this is something else! Dan, gotta get me one of them hats. @Darwin Harmless, Assuming you already have the beard. That is style. @European: for the other cheek, you mean? If you were to investigate the term “MacGuffin” (McGuffin?) in a movie making term dictionary, you’d find that the film “The Innocence of Muslims” is exactly that, it was used as an excuse for the violence and subsequent killing, even though basically no one’s even seen it (or likely ever will), and that it was actually made only for this reason, produced by an extremist right wing anti-Muslim group. Ah, just another day in paradise, eh? FreeFox, ” for the other cheek, you mean?”. Or possibly the ‘fluffer’. Old Mo does have a knack for inflaming passions after all. Darwin Harmless, I’ve seen your photograph; I wouldn’t recommend the hat / banjo combo. Just too Deliverance, old friend.